Tweets are sometimes time-specific and need to be removed after a particular date. 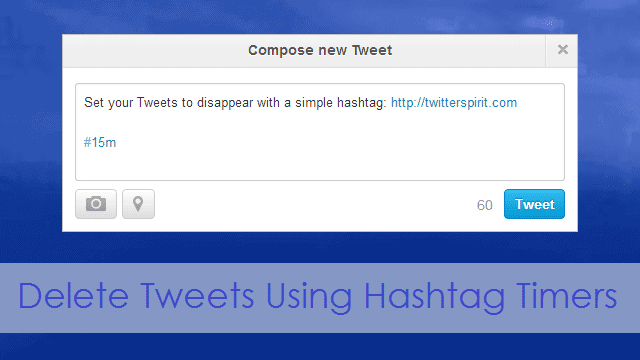 Spirit for Twitter is an online service that links to your Twitter account to automatically remove tweets after a set period using nothing but a hashtag timer. Say you’re posting a tweet about a party that’s happening four days from now. You’ll want people to see the tweet until the party is over, after which the tweet is useless. 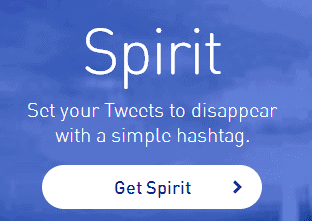 If you’ve signed up for Spirit you can just post a hashtag with your party invitation that tells the service to remove the tweet in four days. Then when the party is over, and the invitation expires, the tweet will be removed. Signing up is super simple, as you just need to give the service authorization to use your profile. The service requires access to read tweets and post new ones. Login to Twitter to authorize the app to use your Twitter account. Using the service is extremely easy. There is no additional app or program that needs to be opened, and it can even work from a mobile device. When you’re ready to use Spirit for Twitter, just add a hashtag to a tweet that designates the time the tweet should stay alive. For instance, if I compose a tweet that includes the hashtag “#2m,” the tweet will automatically delete in two minutes. The same can be done for hours (“#2h”) or days (“#2d”). To end a tweet prematurely, you can of course still remove it with the regular “Delete” link. Visit the Twitter Settings page to revoke access to this app if you no longer wish to use it. This is actually a really cool service. It can be used for party invitations like I mentioned above or anything else like product discount codes and similar posts.